The past week I’ve been busy playing guitar with http://www.relocator-project.com/ on http://www.generation-prog.com/. It’s been a blast and the gig went quite well. But: next week more DSLy stuff again. Yesterday was my last tenured day at my former employer (go and check LinkedIn to find out which one it was) and today is the first day of my new life as an independent. This represents a huge challenge to me, but one I simply had to take on in order to have a chance of getting my message out to the business world -my former employer wasn’t really helping with that. Obviously, my focus will be model-driven software development (MDSD) and domain modeling in a mix of consultancy, a bit of DSL evangelization (e.g. through this blog) and a bit of creation of/contribution to open-source projects. Apart from that, I’ll be getting my hands dirty with some mobile app development. Well, it’s been over a month since the last post…I’ll try and post more often in the near future. Anyway, one of the things I did in the past month was to write a parser for arithmetic expressions by hand. This was mainly inspired by Sven Efftinge’s blog and the workshop I gave which showed that explaining such a parser is actually quite hard. Sven’s movie which actually showed the call stack is rather more enlightening than any verbal account of the matter, so I started thinking about how to do the same thing but then interactively (and without the need to do a voice over which I don’t like to do since I hate hearing my own voice). In the end, I figured that Eclipse’s debugger already provides that functionality so a parser (and lexer) hand-written in Java should already do the trick. 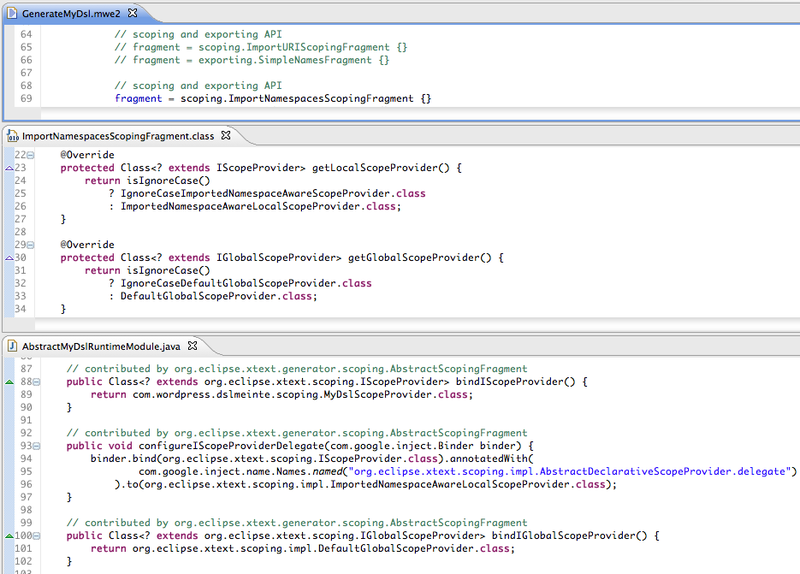 It is a regular Eclipse project which doesn’t use anything beyond a standard Java JRE (>=5) and JUnit4. The parsers share a common lexer implementation and the two latter parsers derive from the first one both for convenience and for sake of clarity -again, the correspondence should be obvious. I matched the parser implementation with the structure of the Xtext grammar definition and also (to a limited extent) with the structure of a generated Antlr-based parser. Comments refer to bits of the grammar which are being matched at that point in the code. Arithmetic expression can contain identifiers (matching /[a-zA-Z]+/) which are essentially defined on-the-fly. I added this to make the lexer slightly more interesting. Unit tests are not too good (or actually not asserting anything for the lexer…). To see the parser and its rule call stack, simply enable a breakpoint at Parser#ruleExpression and run a unit test in debug mode. Let me you know if you find bugs, have possible enhancements or think this is useful (or not!). The result I expected was to parse things like “transient entity Foo” and “abstract entity Bar”. It does that, but it doesn’t accept “abstract transient entity Foo” while it does accept “abstract entity Bar transient“, which certainly checked out with what I intended! concatenation of “abstract tokens”, meaning assignments, keywords, rule calls, actions and everything parenthesized, not separated by anything other than (optional!) whitespace. because the invisible token concatenation operator has higher precedence than the unordered group operator. This explains why “abstract entity Bar transient” is accepted (and yields the same AST as “transient abstract entity Bar”) but “abstract transient entity Foo” not (the abstract keyword is separated from the entity keyword). The fix is easy enough: just enclose the entire unordered group in parentheses, just like you would do a group of alternatives. I also noticed that (lone) keywords and rule calls can have cardinality postfixes as well, at least syntax/grammar-wise -I haven’t checked what happens at and after generation and whether semantics are what you’d intuitively expect. It’s certainly something I haven’t seen used in any grammar so far! This post is about how to take control of configuration of the local and global scope providers through a custom scoping fragment. In the .mwe2 workflow file (I’m assuming you’re on Xtext 1.0.1 and Eclipse Helios) the scoping is configured through an appropriate Xtext generator fragment. 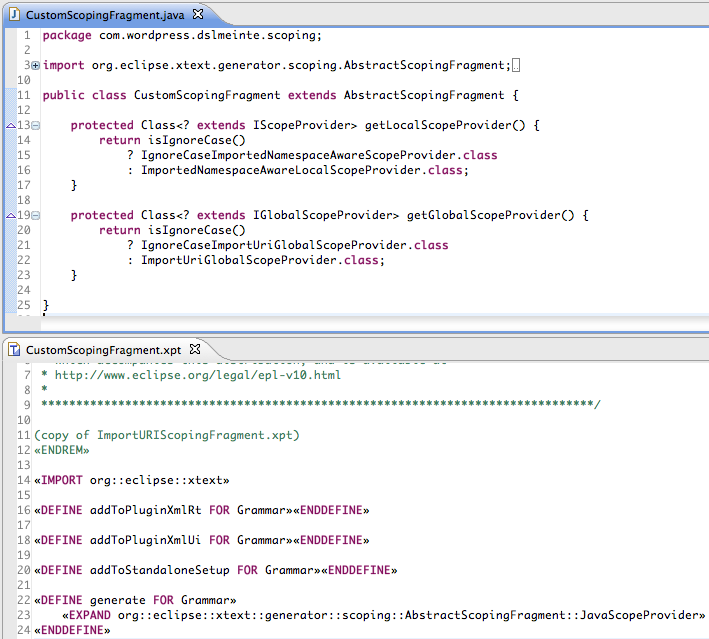 Xtext is shipped with an org.eclipse.xtext.generator.scoping.AbstractScopingFragment support class and two implementations (in the same Java package): ImportNamespacesScopingFragment and ImportURIScopingFragment. The MWE2 workflow file (in the 1st editor) specifies the ImportNamespacesScopingFragment as (only) scope fragment. The source for the fragment (2nd editor) shows that in this case-sensitive case, the delegate local scope provider is to be an instance of ImportedNamespaceAwareLocalScopeProvider and the global scope provider is to be an instance of DefaultGlobalScopeProvider. Indeed, the 3rd editor shows that IScopeProvider is bound to the custom local scope provider, the delegate field (which is appropriately tagged using a Guice Named annotation) to ImportedNamespaceAwareLocalScopeProvider and IGlobalScopeProvider to the DefaultGlobalScopeProvider class. As you already can guess from the fragments’ source in the example above, the two default implementations of AbstractScopingFragment mentioned above both declare both a global scope provider class as well as a local delegate scope provider class, so when configuring both fragments in the DSL generator workflow, the bindings will override each other and order is important. This is particularly annoying in case you want both the namespace-based imports as well the global URI imports functionality -after all these don’t necessarily conflict. Also, you have to configure at least one scoping fragment in order to have the custom scope provider bound, which may mean that your DSL could have unwanted scoping properties. This is indeed what we wanted. Note that the two standard scoping fragments will usually suffice, since you can override basically anything in the custom scope provider. But, for full-blown language development as well as for language modularization it sure comes in handy to have ultimate control of the scoping architecture.